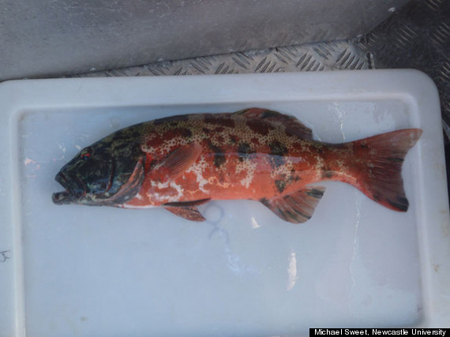 The black spots on this Coral Trout are melanomas. For the first time in history, a wild marine fish species has been identified with skin cancer off the coast of Australia. 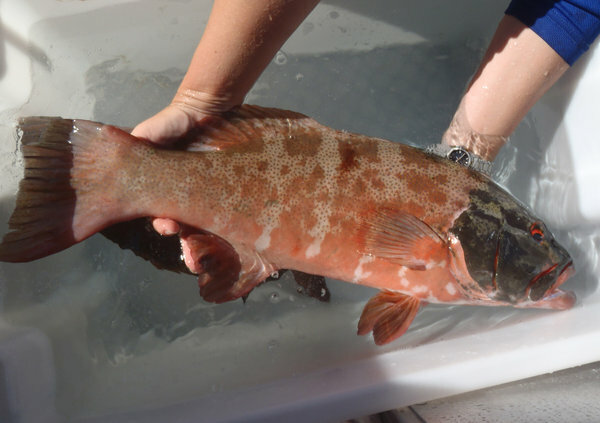 Caught on the Great Barrier Reef, coral trout have been discovered with large black spots on their skin, now identified as cancerous melanomas. One researcher documented that 15% of these fish found on the reef show signs of skin cancer. The percentage may even be higher due to the fact that some fish may have died due to illness or consumed by predators. Researchers state that melanomas on the skin of these fish were likely due to the UV radiation and the closeness of the fish species to the hole in the ozone layer over parts of Antarctica and Australia. (No wonder I got “surfer’s eye” induced by extreme sun exposure in my year abroad in Australia..the sun really is MORE intense there!) Hence it is no wonder that Australia has the highest occurrence of skin cancer in the entire world. That boils down to the fact that 2 out of 3 Australians will be diagnosed before that age of 70. Very unfortunate…wear your sunscreen Aussies! Alright back to the fish- the researchers from the Australian Institute of Marine Science were on the reef doing a survey of shark prey, i.e. coral trout. They saw the discoloration on the fish and after examining it under a microscope, discovered it was cancerous tumors. The fish were caught off of Heron Island (where I did research on tube worm larvae!) and One Tree Island – which make up the southern portion of the Great Barrier Marine Park. 136 fish were caught, resulting with 20 (15%) showing signs of skin cancer. Even though this is just the first published report about fish with skin cancer, I’m sure the occurrence isn’t new. Some fishermen trace it back to as early as the 1980’s. The diagnosed fish didn’t show signs of illness, but that also doesn’t mean that many of them have already died from the cancer once it got invasive. Questions and answers are still yet to be answered pertaining to skin cancer in fish- I’ll try and keep you posted as best as I can on this issue. I think I read too much. Considering the damage we are doing to the food chain, we can’t eat anything! I’ve been a pescatarian for almost half my life. Now I have to cut out fish, too? And what about all the gmo foods? And the pesticides and misleading labels on food such as “all natural” or”free range”? Supposedly, free range isn’t so free and all natural can have up to a certain amount of insect parts or rat droppings or some such traces. I think I’m just going to keep to a liquid diet until they tell me excessive alcohol causes brain damage. I think in terms of mass produced food in this world, there’s always going to be something wrong with it for the most part. We just take, and take, and take, and take from the food chain without replenishing it to the necessary standards (i.e. not being sustainable). So what’s left is usually genetically modified food that’s substandard, or mislabeling of products. I’m not up to date on the “free range” discrepancies- I’ll look into that. Hahah..goodluck with that liquid diet! Eeek yeah be careful! You can never put on TOO much sunscreen.